So as you see, keeping up our water intake has a great deal of importance in order for us to be our best self. I know, I know, you heard this before BUT why don’t you do it? Don’t worry, I’ll wait……… While you’re explaining why you don’t drink any or as much water as you should, here are a few tips to help get that intake up so you eventually make it a part of your life and what you do normally. Wait! I almost forgot…what is the goal amount you should aim for? Let’s shoot for 50% of your body weight in ounces, that’s a good place to start. So, if you weigh 200 lbs, make it a goal of yours to minimally get in 100 oz. of water everyday. Now on to the tips. You’re busy, right? You forget, right? We have these smart phones on us all the time, so let’s use them. They allow us to set an infinite amount of alarms or reminders. Make the alarm have a purpose so it gets you to your goal. If you’re goal is to drink 100 oz. 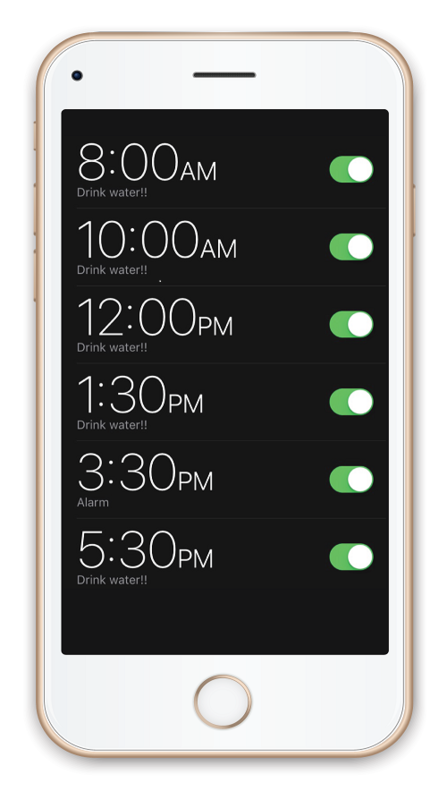 of water each day, then set 5 alarms or reminders, each time it goes off you have to drink 20 oz. of water. By the time the day is over your goal will be reached. Sweet!! You can even have the reminder say, drink 20 oz. of water. Can’t be any easier than that, right? Make it be the first thing you do in the morning when you wake up. You just went 5 - 8 hours without drinking any water. Even though you were sleeping, you were still losing fluids by way of breathing, your mid-sleep bathroom runs, and of course, the rest of your body is still functioning and using fluids to make things happen internally. So your body is craving it when you wake, and even better, it will help jolt your body to wake up and be energized to get the day started!! It’s easier to drink it when you have it around you at all times. Having it there will serve as a reminder that you need to drink it. They even have different types of bottles to help you get the job done. I’ve seen bottles with daily benchmarks to hit as you drink your water throughout the day. I’ve also seen devices or other bottles that have reminders on them so the bottle lights up, beeps, talks to you or vibrates, yes it’s freaky. Nowadays there is a device for everything you need. Find which one works for you and make it happen. For those that say, “I don’t like water because there is no flavor.” Simple solution, add flavor to it. Make the addition of flavor come from a natural source. You can add different fruit or vegetable slices to your water to spice it up a little to make it more desirable to drink. If you struggle getting actual water into your system, then eat your water. What do I mean by that? I know it doesn’t sound possible. But, what I mean is increase your fruit and vegetable intake. They will supply you with some fluids because they have a very high fluid content. Not food appetizers but phone Apps, if they’re your thing. There are plenty of them out there to choose from to help you track your intake, set reminders, keep logs so you can look back at how you’ve been doing. They have all the bells and whistles an App can give you to help you drink more water. There you have it ladies and gentleman, 6 simple ways to increase you water intake. Maybe you have tried one or a few of these before, and it didn’t work for you. That’s okay, you have options now. Give a different one a shot and see how it goes. If you have a trick that you use that works for you, we would love to hear it, shoot it on over to me at kerry@212healthandperformance.com. Until next time, continue to live life 1 degree above the rest, and drink your water.